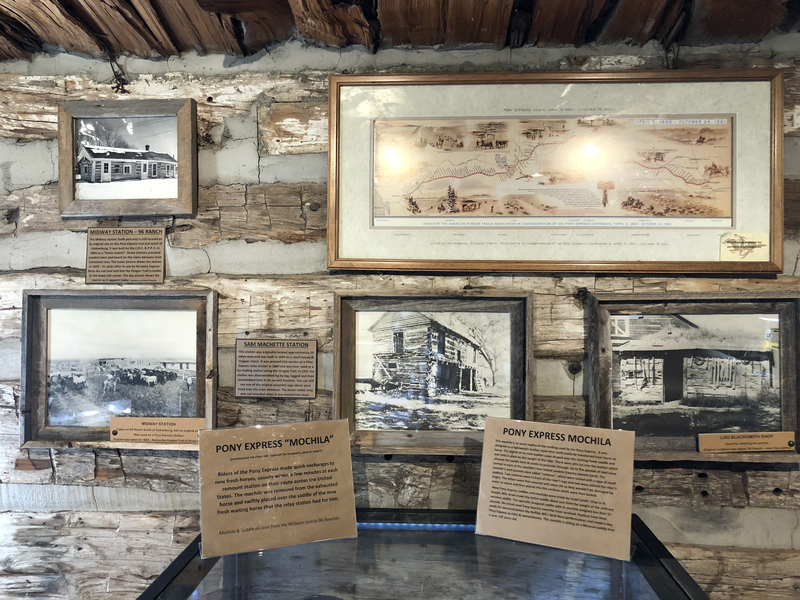 Last week’s Longhorn Parade post kicked off an Old West run for this blog, with info about settlers, pioneers, cowboys and the like coming to you in the next few weeks. 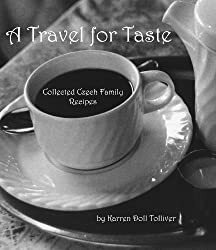 This will toggle back and forth from Italy in the Throwback Tuesday Posts (TBTP) each week. Up next: the Pony Express. 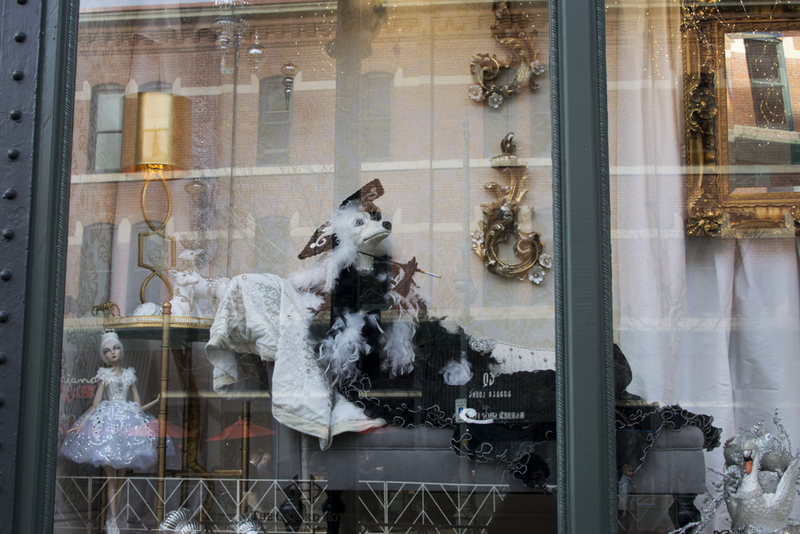 On the way back from a roadtrip to Lincoln, Nebraska (see the NE posts about the Morton Mansion, its carriage house and Arbor Day Farm, Lee’s Chicken Restaurant, and a giant Paper Airplane Sculpture), my husband and I stopped in Gothenburg, Nebraska. It’s a very small but beautiful town, and it’s more or less halfway-ish between Denver and Lincoln, off I-80 at NE-47. But why did we stop there? 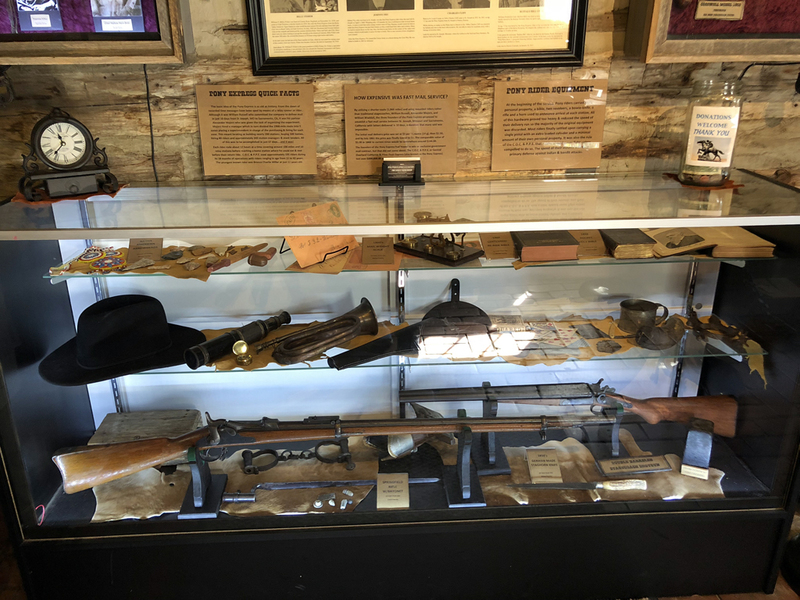 Why, the Pony Express Station Museum, of course! 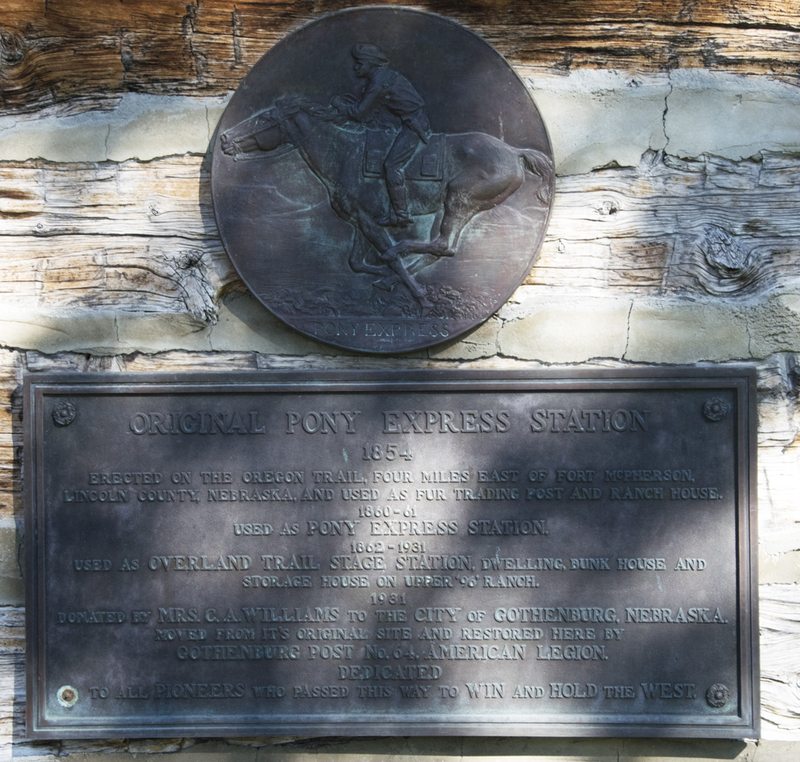 This actual Pony Express station originally stood a few miles away on the Upper 96 Ranch. It originally had two stories with one side open. The ranch owners donated the station to the city of Gothenburg in 1931. It was disassembled log by log and reassembled as a one-story in the wonderful little Ehmen Park. But I’m getting ahead of the story. 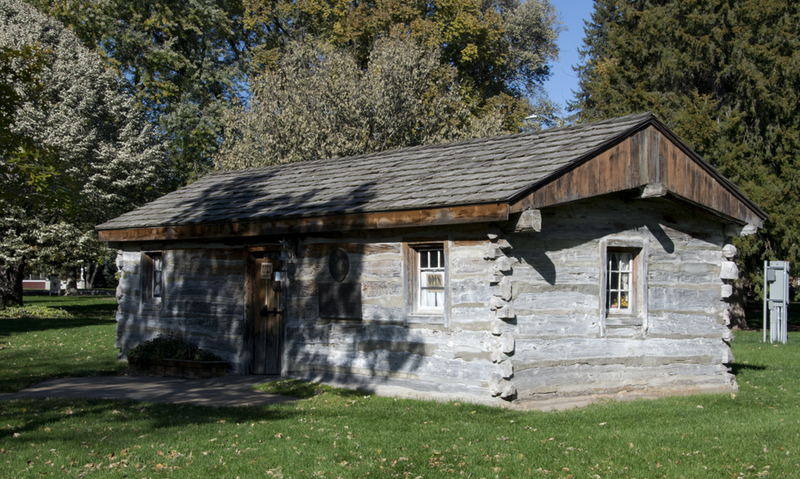 This rough-hewn log cabin was built in 1854 and used as a fur-trading post and ranch house. At maybe 200 square feet (my estimate), it was the original tiny house! 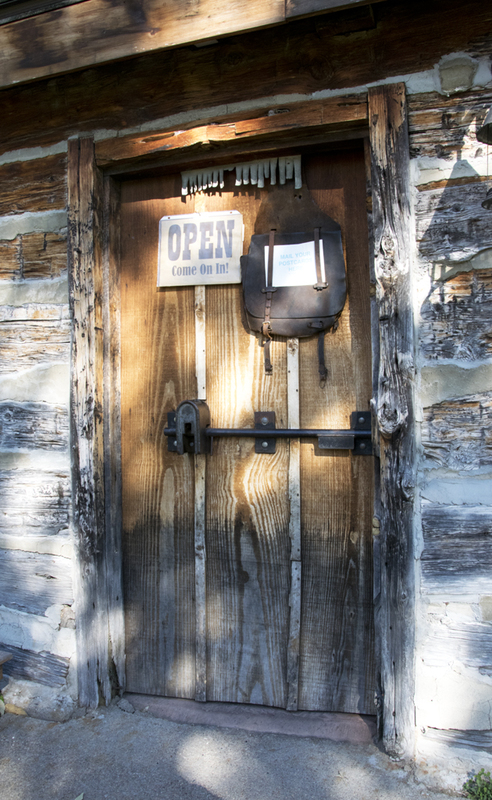 From 1860-61, it served as a Pony Express station. 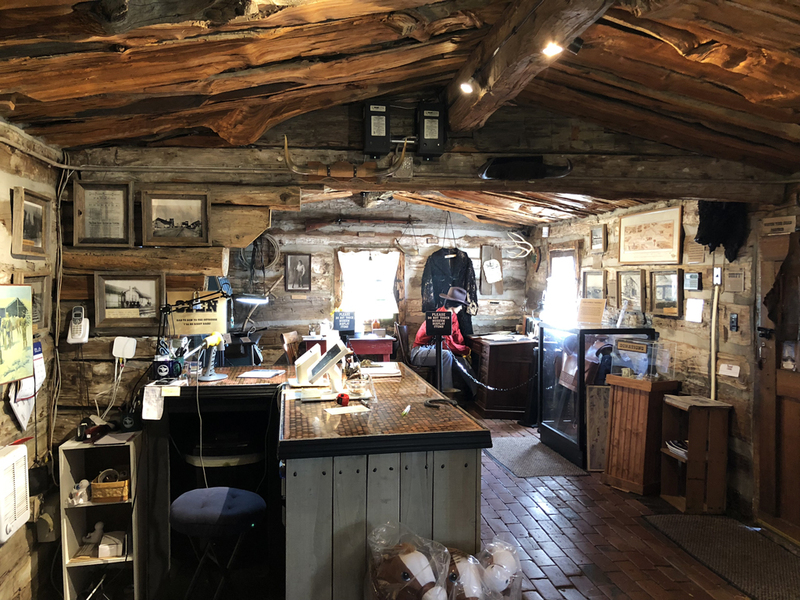 From then on it was variously used as a stagecoach station, a house, a storage shed and a bunkhouse until its donation to Gothenburg in 1931. I’m amazed it stood for so long! The Pony Express was a mail-delivery company whose route was between San Francisco and St. Joseph, Missouri, about 1966 miles. Riders left both cities on April 3, 1860, heading toward each other. It took about 10 days on average for a letter to make it from one end of the route to the other. Add another 10 days if the letter came from the East Coast to Missouri. Letters sent via stagecoach or steamship took about a month. The Pony Express was started as an attempt to get a federal contract to officially handle the US Mail. Alas, the company did not receive the contract after proving to be a most efficient service. The company folded in 1861 without the federal contract, and also because coast-to-coast telegraph lines had been completed, eliminating the need for much of the mail delivery. While the telegraph lines were being built, Pony Express riders also carried telegrams between gaps in the lines. The Pony Express was a financial failure, with an ending deficit of over $200,000. More than 200 employees included station keepers, stock or horse tenders, blacksmiths and cooks. Eight riders were killed on the job: four by Native American war bands, one was hanged for murder after he drunkenly killed someone, one died “in an unrelated accident”, and two froze to death. It wasn’t easy out on the trail! Job ad for a Pony Express rider: “Young, skinny, wiry fellows, not over 18. Must be expert riders. Willing to risk death daily. Orphans preferred.” Gee, sign me up! 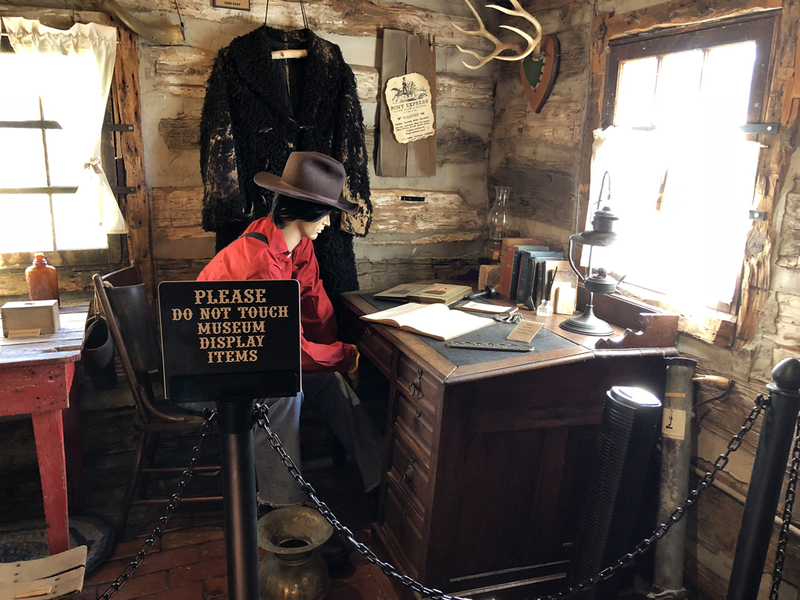 Wild Bill Hickok was a Pony Express rider and purportedly killed several of the McCandless gang during one of his rides. 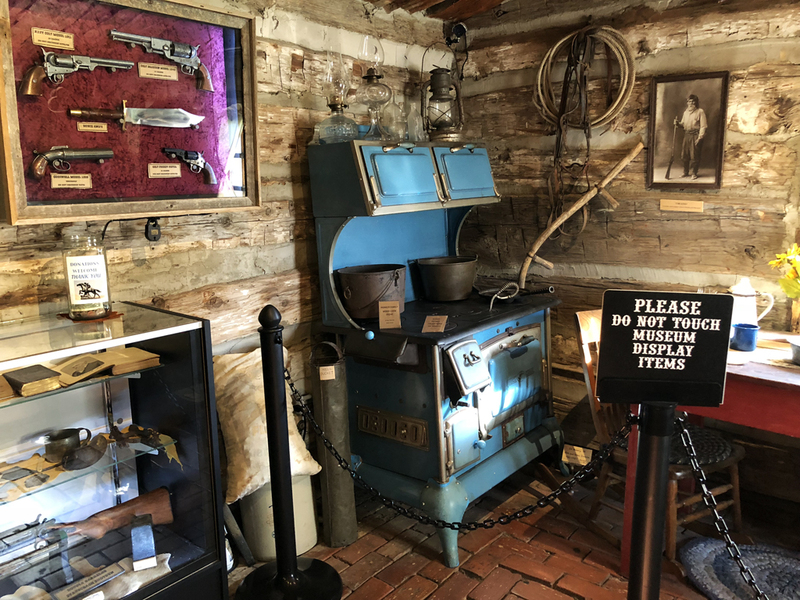 The place was full of old photos and Old West paraphernalia. Here’s a picture of Gothenburg back in the day – note the complete absence of trees on the prairie. All the beautiful green trees I saw that day had been planted by settlers and more recent residents. The bugle in the pic below was used by a rider as they approached a station to alert the station manager to have a fresh horse ready. Some riders just shouted. 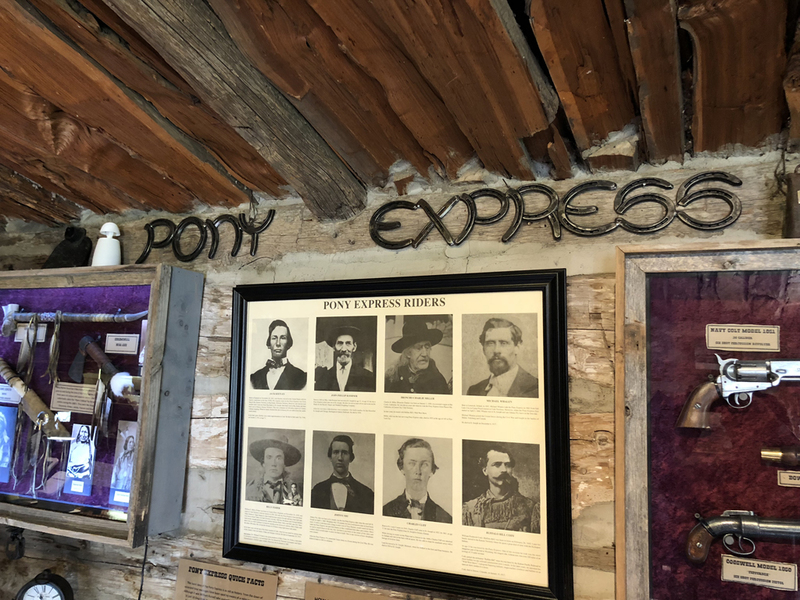 I was very excited to learn that the National Pony Express Association conducts a re-ride of the Pony Express route every year in June! I’m planning a road trip to see it this year. Can you imagine?? 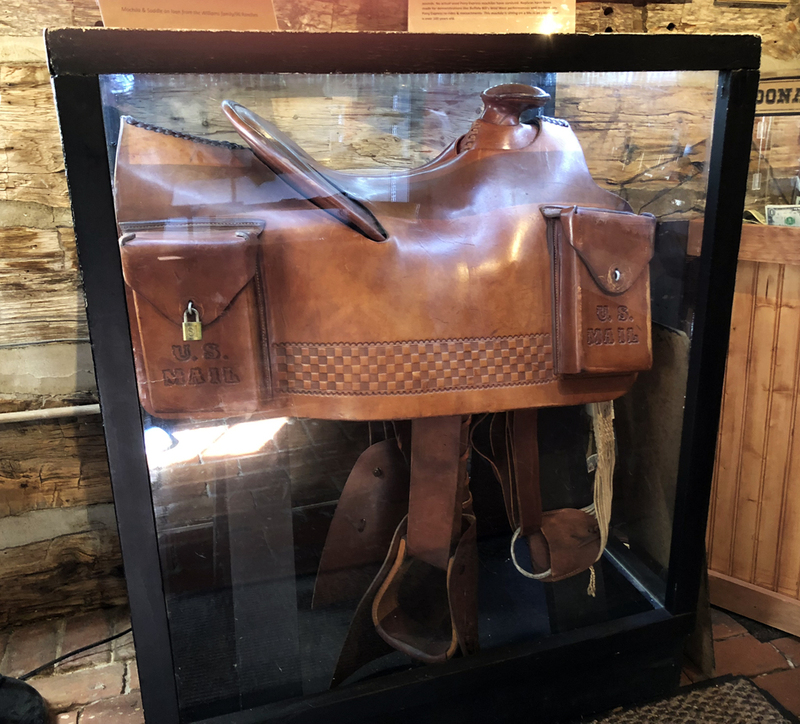 If you visit their website, you’ll see how to “Follow the Mail” during the ride (the mochila has a GPS in it) and even mail a letter to be carried by the riders! I’m doing it. Moreover, if you have a horse and are willing, you can even be one of the riders! They also have lots of cool souvenirs in the station museum. I bought a very cool Pony Express Messenger badge to add to my collection. They had tons of interesting things to buy, as well as several freebies, like a newspaper about the Pony Express. I was encouraged to take as many as I wanted. Admission is free to the museum, but it’s only open April through October (April: 9a-3p; May-Sep: 9a-7p; Oct: 9a-3p). I was lucky to have happened upon it before it closed for the season. You can always access the outside of it, though. It’s in an open public park. And I can’t say enough how wonderfully friendly and knowledgeable the volunteers were who we met that day!